Selma and LBJ: Why critics are wrong about how the film portrays President Johnson. Critics say Ava DuVernay’s film isn’t fair to LBJ. That’s because it’s about a movement, not leaders. 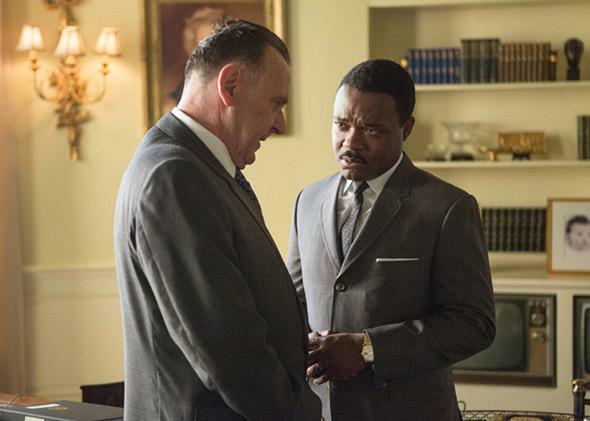 Tom Wilkinson as Lyndon B. Johnson and David Oyelowo as Martin Luther King Jr. in Selma. Ava DuVernay’s Selma is likely a top contender for the Academy Award for Best Picture. With its focus on the power of activism to force political and moral change, the highly praised film has the right message for our present moment of racial unrest. But not everyone is happy with the way it approaches history, and in particular, how it portrays President Lyndon Johnson. That’s a huge exaggeration. Activists had been organizing in Selma, Alabama, for at least two years before Martin Luther King Jr. met with Johnson, and weeks prior to his meeting with the president, King and his allies had decided on Selma as the site for new action and protests. By the time Johnson suggested something similar to King, the plan was already in motion. But more than that, that entire line of criticism is misplaced. Selma isn’t a documentary or even a dramatized history. It is a film based on historical accounts, and like all films of its genre, it has a loose relationship to actual history. In Alan Parker’s Mississippi Burning, the investigation to solve the murders of three civil rights workers in 1964, is transformed into a story of FBI heroes, one that ignores the role of local activists in bringing the killers to justice and doesn’t touch the bureau’s famous antagonism—under J. Edgar Hoover—toward the civil rights movement. It’s with these questions in mind that we should approach Selma. But first, we should look at how DuVernay actually presents Johnson (played by Tom Wilkinson) and his relationship with King (played by David Oyelowo). Now, there’s a case that even this is unfair to Johnson. While it’s true he didn’t want to introduce a voting rights bill so soon after the Civil Rights Act of 1964—he needed votes for his economic program, and he didn’t want to alienate Southern Democrats—it’s also true that, in late 1964, Johnson told Attorney General Nicholas Katzenbach to write the “the goddamndest, toughest voting rights act you can devise.” This draft was written with help from Senate Majority Leader Mike Mansfield and Senate Minority Leader Everett Dirksen, and was the basis for the bill the leaders introduced in March 1965. The Johnson of Selma, in other words, is much more reluctant than the Johnson of reality. This is most clear in the scenes with Hoover (played by Dylan Baker), where Johnson allows the FBI director to harass King’s family with evidence of his infidelity. This is a far cry from real life. Yes, Johnson knew the contents of the FBI’s file on King, but there’s no evidence he conspired to smear him. That was a Hoover project, with no connection to Selma or the Voting Rights Act. Johnson may have been frustrated, but he wasn’t stupid, and attacking King would have only radicalized the movement, pushing it closer to its more militant activists. As much as King needed Johnson, Johnson needed King. If you need a clue, look at the people portrayed in the movie. If you don’t count Martin Sheen, who plays federal Judge Frank Minis Johnson Jr., Johnson and Wallace are the only politicians. Almost everyone else is an activist or an ordinary citizen: Carmen Ejogo’s Coretta Scott King, Lorraine Toussaint’s Amelia Boynton, Wendell Pierce’s Hosea Williams, Keith Stanfield’s Jimmie Lee Jackson, Stephan James’ John Lewis, Jeremy Strong’s James Reeb, André Holland’s Andrew Young, and many, many others. If Selma could have been better, it wasn’t because DuVernay didn’t do justice to Lyndon Johnson, but because there was so much to show about the ordinary people of Selma, and we—as viewers—don’t see it.